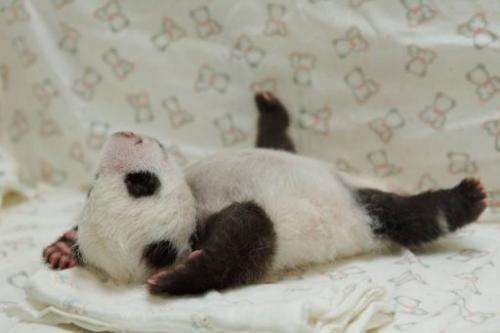 This undated handout photograph released by the Taipei City Zoo on August 11, 2013 shows the newborn panda cub Yuan Zai. Taiwan's first newborn panda has been reunited with its mother for the first time since it was taken away after birth, in a heartwarming reunion that saw the giant panda licking and cuddling her baby inside a cage. Taiwan's first newborn panda was reunited Tuesday with its mother for the first time since it was taken away after birth, in a heartwarming reunion that saw the giant panda licking and cuddling her baby inside a cage. Zookeepers in Taipei had to separate tiny Yuan Zai from its mother, Yuan Yuan, last month, to be raised in an incubator as the cub needed care and round-the-clock monitoring after it was slightly injured while being bred a few days after birth. The female cub was put inside Yuan Yuan's enclosure Tuesday where the mother gently picked her up, embraced and breastfed her in an heartwarming scene that immediately made waves in the local and international media. The mother and daughter later fell asleep together following the reunion that lasted several hours. The zoo said it was still evaluating when the 39-day-old cub can be formally reunited with her mother. The cub, the first panda born in Taiwan, was delivered on July 7 following a series of artificial insemination sessions after her parents—Yuan Yuan and her partner Tuan Tuan—failed to conceive naturally. The birth of Yuan Zai, which means child of Yuan Yuan, has sparked great joy in Taiwan with local media carrying daily reports and photos on her growth. The public will have to wait for another two months to see her. 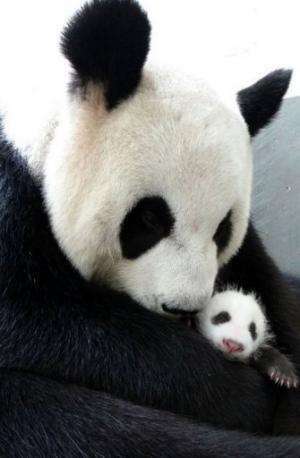 This undated handout photograph released by Taipei City Zoo on August 13, 2013 shows giant panda Yuan Yuan hugging her cub Yuan Zai at Taipei City Zoo. The Taipei zoo has kicked off a naming campaign for the cub, with the public voting on what to name her and the final result expected to be announced on October 26. Tuan Tuan and Yuan Yuan were given to Taiwan by China in December 2008 and have become both star attractions at Taipei Zoo as well as a symbol of the fast improving ties between Taiwan and its former bitter rival China. Taiwan will be allowed to keep the cub as the panda couple were a gift from China rather than a loan, Taipei officials have said. Fewer than 1,600 pandas remain in the wild, mainly in Sichuan province, with a further 300 in captivity around the world.